Tori's Pretty Things: Tori's Pretty Weekly Wrapping - New Weekly Series! Tori's Pretty Weekly Wrapping - New Weekly Series! Well hello! Welcome to my new weekly series! I'm a woman with many creative outlets - nails, fashion, beauty, cooking, baking, exploring.. the list goes on and on. But I'm going to be frank - as much as I want to write a daily post on every single thing, I just don't have the extra free time to pump out content on content on content. But I can't help it - blogging just makes me so happy! I'm a natural-born writer so this in-depth outlet lets me chat with you more, share more of my life, and gives me a better way to add some creative inspiration to your life! Maybe in the future I'll break this out into more in-depth and frequent posts. For now, this my smile-inducing middle ground. Gals, if you are as obsessed with light blue polishes as I am then you NEED to get your hands on this one! For their holiday release, OPI created a Breakfast at Tiffany's-themed collection. As an avid polish collector, I knew as soon as I saw the promos that this shade needed to join my stash. Light blue just screams Spring and so I was saving it for these warmer months. While I can't really say the month is much warmer... (#WelcometoCanada), at least my nails have this whole, "It's now Spring!" thing down. I painted two very easy coats and let the polish dry completely. Then I used an "X" stencil from What's Up nails and painted Zoya's Cosmo pixie dust glitter polish over top. While I wish I painted the glitter first and then used the Blue over top, I'm still pretty happy with the results. On that same "It may be Spring but the weather sure doesn't feel like it" sentiment, why is March fashion so difficult? I just want to "Wear all the Spring!" but the weather keeps saying, "Here's all the cold!" Le sigh. 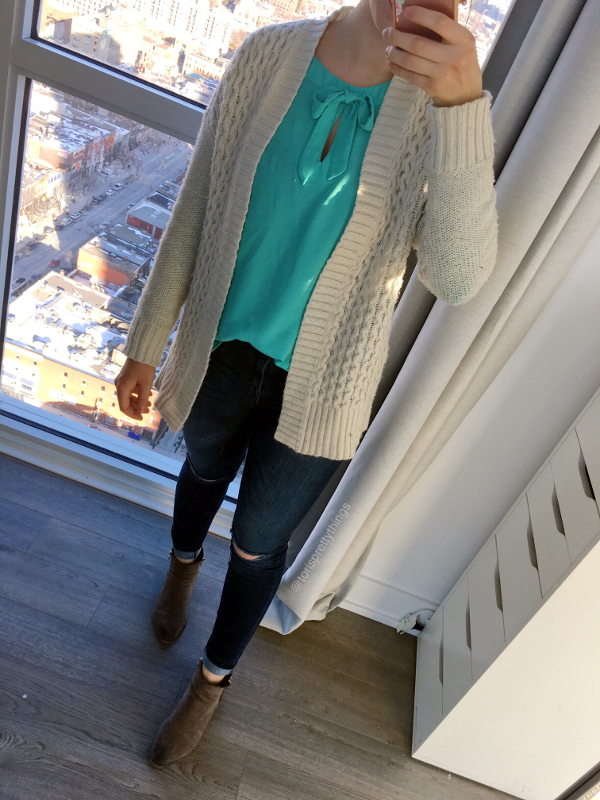 I scooped up this Forever 21 blouse roughly five years ago and it's a true Spring staple now. Goes to show that sometimes fast fashion doesn't always mean poor quality :). As a March weather compromise, I like to make outfits similar to the above. 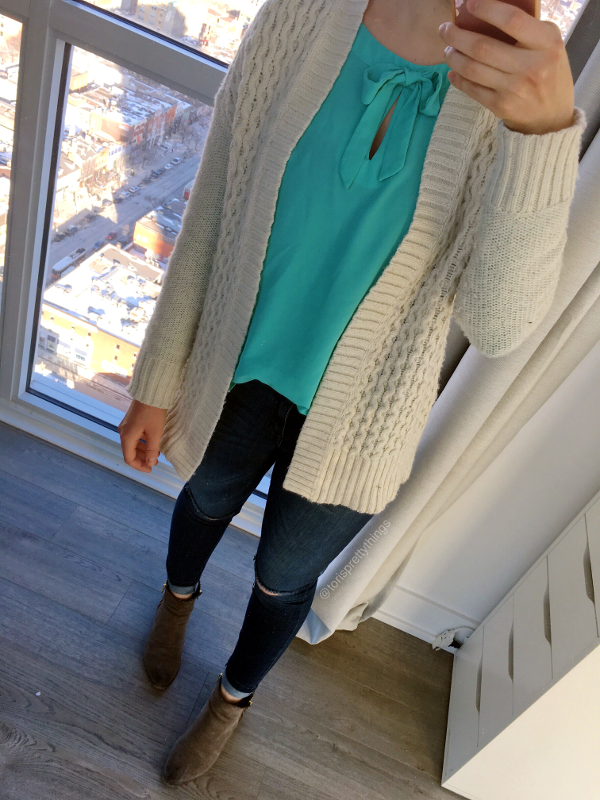 Take one part bright blouse, one part chunky knit cardigan, toss in some trendy ripped jeans and pop on taupe booties. Voila! You quell those "Must Stay Warm" feelings but feel those "Yay, Spring is here" vibes! 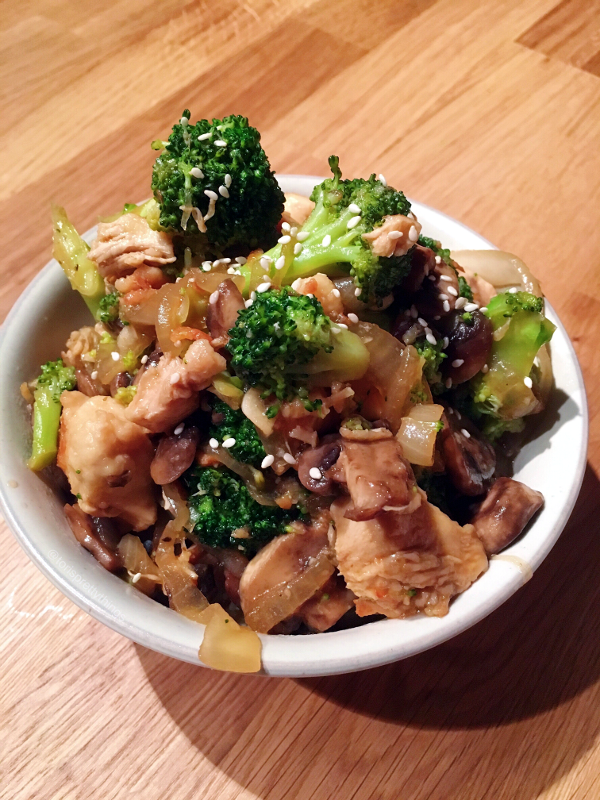 This recipe was so abso-freaking-lutly delicious! 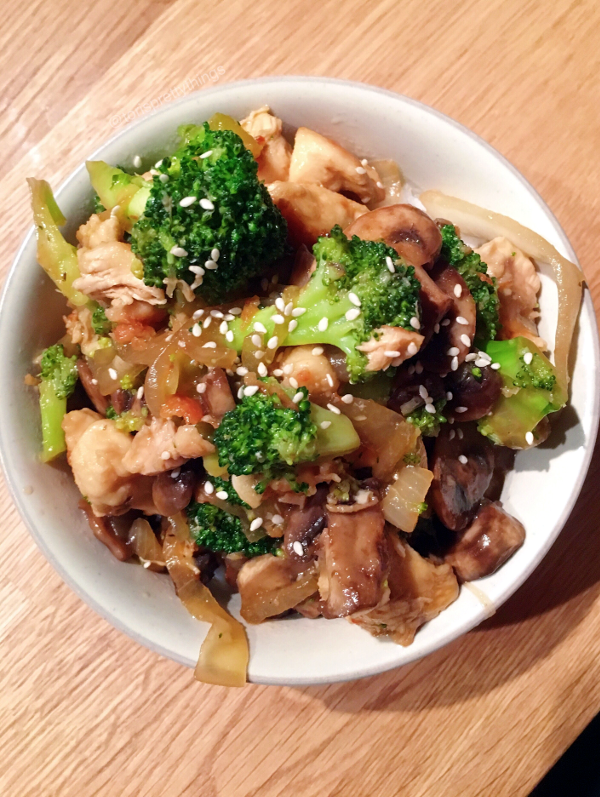 Not only did it check off those Chinese-food hunger pains but this recipe was fairly simple and fairly healthy. Check, check, check! Plus, I just had a really great time making this. In general, I'm trying this new thing where I stop treating my diet like a yo-yo. I have a terrible habit of eating right and regularly exercising during the warmer months, but from October to February I indulge in more junk than I'd like to admit. So this year I'm vowing to make a true, lifestyle change and I'm putting this here for accountability. It's time be a grown up and find some balance. So here's to a mostly healthy diet full of healthly deliciousness like this, with a weekly cheat meal for good measure :). Chocolate = Health goals? #amIright? 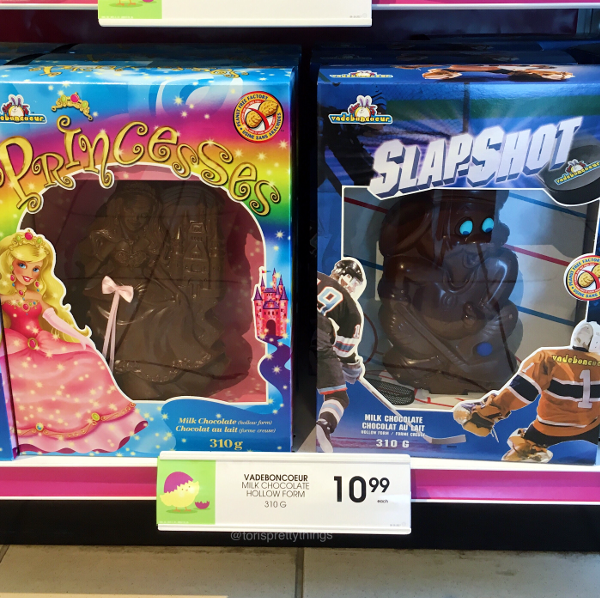 I definitely did not purchase either of these but couldn't help but laugh out loud when I saw this in Shoppers last week! What an incredibly symbolic way to speak volumes about the subtle differences of Canadian versus American living :). In the US? This would be a Princess and a Baseball player. In Canada? It's a Princess and a Hockey player. #YouGoCanada! Speaking of those new health goals, I am SO obsessed with this new app called Apptiv! I'm a very self-motivated person but even I have a hard time really knowing what to do in a gym. I would love a little help but want help on my schedule, without all that pressure, and without spending a gob of money on it. Plus, Pinterest Fitspo is great but it only goes so far. Who knows how legit those workout plans are, anyway? Guided workouts to help you meet your fitness goals, on your own time, and at your own pace! The $10 a month is completely worth it for me to have a coach in my ear every time I'm on a treadmill, guiding me through a workout, and keeping the motivation high. I know this sounds like a paid advertisement but I'm not getting paid a cent to talk about this. This app is just really, really working for me so maybe it could work for you, too! It's pretty much like taking a personalized fitness class everytime I'm at the gym, without 30 other people that I'm pretending not to compare myself against. However, let me clarify - when I said cheat meal, I meant cheat meal! 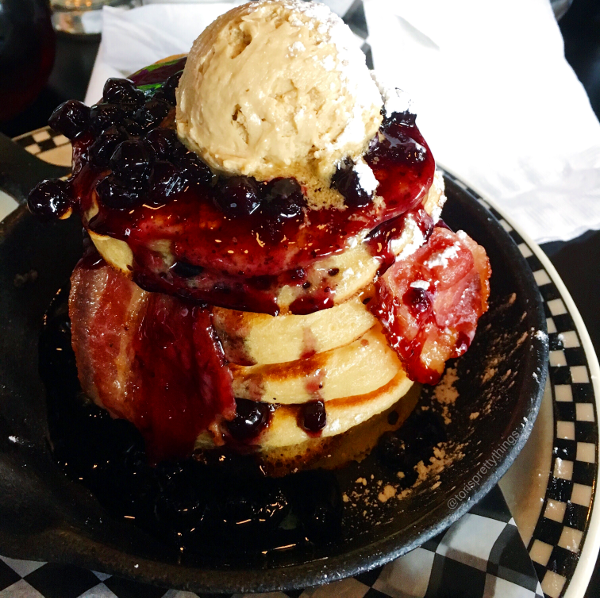 Insert this week's cheat meal with the Blueberry Hill pancakes from Old School. Wowwie! A few weeks ago, I found Old School on Yelp and those blueberry pancakes just melted my soul. It's a good 20-minute walk away but this past Sunday, B and I decided to venture. My goodness am I glad we did! The decor was super hip, the service was great, and those pancakes - they spoke to a craving I didn't even realize I had! 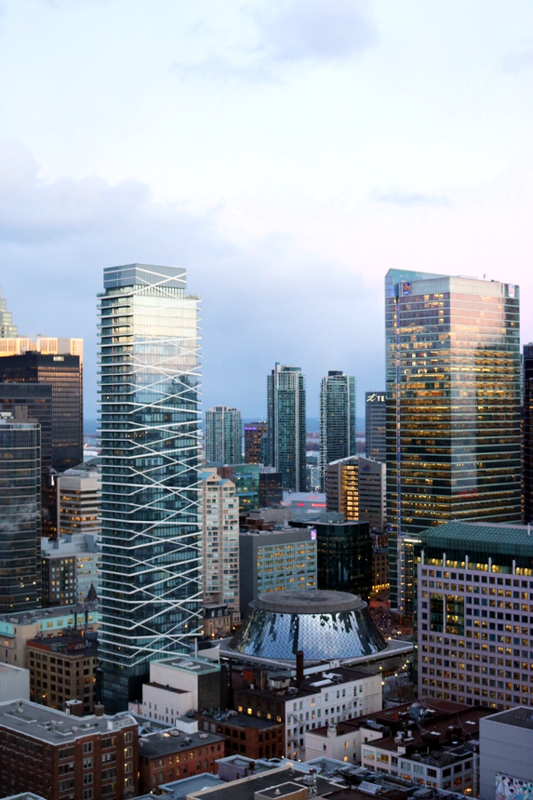 If you're spending some time in Toronto, I highly recommend this gem. But get there early like we did... according to Yelp, this place packs up fast past 11 am. Now it's your turn. I'd love to know what you think about this series and get a conversation going. So tell me - what was the best part of your week?